It has always seemed to be a bit of an enigma. Here we are enthusing about manifestations of an old musical culture that only adapts slowly and resists change ... and we are using the most modern of communications systems to share this enthusiasm. Well, one of the advantages of newer aspects of computer useage now opens up different possibilities, as Rod Stradling explains in the press release which accompanies this album. "New technology now allows a small organisation like ours to create CDs via computer, and opens up a whole new vista of potential releases of field recordings, or of re-issues of 78rpm material , for which the size of the market would have made such enterprises impossible only a year or so ago." (It also extends the possibility of piracy and home copying from cassettes to CDs, but that is not the concern of this review!) The fact that we no longer have to think of the economies of scale will make a lot of us look at old tapes that we have filling our lofts and think again about them. In what way do these differ from the usual commercially produced compact discs? Well, the only difference is a visual one. These have a paper label stuck on them, rather as a vinyl album would, rather than having the information imprinted on them. The sound quality would seem to be no different. It just depends on the quality of the recordings. These were made in Bob's house in Snape in 1969 by Rod & Danny Stradling and then by Bill Leader. It will come as no surprise that the quality of the recordings made by the enthusiasts, although perfectly acceptable (sound clip), is inferior to that of the professional, and that on Rod and Danny's, we can hear some enthusiastic joining in of the choruses. Their recordings, unlike Bill's, were not made with a commercial release in mind. Between them, they recorded some 68 songs, 22 of which were common to both sessions. That leaves the 46 which make up these albums. How did they select from the twice recorded items? "We hope that the best performances have been included and have tried to make technical quality a secondary consideration." All the songs that are on the 1973 Topic album 'Songs From Suffolk' recorded by Tony Engle are also heard on this issue. It is interesting to compare the selection process that has taken place. 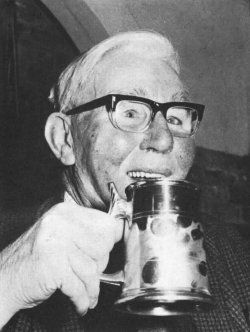 "Folk singers don't only sing folk songs" says A L Lloyd in the Topic sleeve notes, but the 14-track Topic album contains John Barleycorn, The Female Cabin Boy, The Banks Of Sweet Primroses and most of the items that would be considered as true folk songs, though you might have expected Topic to want The Foggy Dew and The Dark-Eyed Sailor. Whereas what we have here is a broader representation of his repertoire which includes sentimental pop songs (Break the News to Mother, I'll Take You Home Again, Kathleen), comic songs (His Day's Work was Done, The Drums Went Bang, Funny Little Place to Have One [sound clip]), hymns (While Shepherds Watched), patriotic songs (Just Before The Battle, Mother, Why Shouldn't We Sing) and all the other sort of items that we would expect from a English rural singer born in the last decade of the nineteenth century. What you would not necessarily expect would be the quality of singing that we get here. 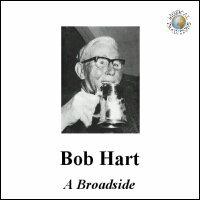 At the time of this recording, Bob was essentially a pub singer and was finding it difficult to get the range of his repertoire listened to - as he complained to the Stradlings, "They only want the funny ones or the choruses these days (sound clip). I don't get more'n one of the others in a night." A few years later in the mid '70s, Ginette Dunn noted that Bob, Percy Ling and others were to find a "new and perhaps vital audience" for their more serious songs in local folk clubs - in his case the one in Leiston. My experience with the old Sussex country singers in folk clubs in those years and the importance that they placed on singing in the clubs exactly reflects the East Anglian experience. First World War veteran, farm boy, trawler and drifterman (sound clip), gardener, a life long inhabitant of one locality, Bob's life was the very epitome of that which would produce a good traditional singer, but it was the tragic loss of wife and both sons in the three years after he retired that more or less forced him into the convivial life of a pub singer. "After I lost the wife and the boys, rather than mope, I knew I'd got to do something, so I kept with the crowd and started singing". The quality of his singing and the authenticity, sincerity and commitment that he brings to it should be enough to sell thousands of these albums even twenty years after his death, but we all know that this will not be the case, so let's be thankful that this new cottage industry has made the project possible at all. Technically, it would heve been possible to ask people to pay to download all the songs onto floppy discs as Real Audio, along with information and photographs contained in the well-produced 10 page A5 booklet, including excerpts from Ginette Dunn's excellent essay on Bob. Personally, I'm glad that they have gone for the present format. Let's hope its the first of many from MT.